The following article by Rt. Wor. Bro. Rabbi Dr Raymond Apple, AO RFD, Past Deputy Grand Master of the United Grand Lodge of New South Wales & the Australian Capital Territory, originally appeared in Freemason magazine, Summer 2010, vol. 42, no. 4 (published by the United Grand Lodge of NSW and the ACT). Middle-aged and elderly adults all remember how important their set-square and compasses were as geometrical instruments in their school days; masons value these two working tools not only for their prosaic but for their poetical significance. The general explanation that comes across from the ritual is that the square teaches us to be just and upright, to square our actions. The compasses tell us to keep our passions and desires within bounds. Whatever the precise terminology which the ritual employs, the message is the same – the square and compasses remind us how to think, act and live as fair and decent human beings. The moralistic explanations are however not the end of the story. Daniel Beresniak, in his 1997 Symbols of Freemasonry, gives the two instruments a still broader significance. Pointing out that they are crucial to geometry, which in its turn represents man’s concern to understand his world by measuring things, he argues that the square and compasses are symbols of man’s capacity for objective thinking. “In the Middle Ages”, Beresniak writes, “the teaching of geometry cleared the way for objective thought. Until that time, all knowledge had been handed down from an authority which meant to put a stop to any debate and eliminate doubt or the need for proof. Only one kind of knowledge could not be taught in this way – geometry. A theory about the properties of a shape can only be accepted when it has been verified using reason, and a square and compasses. “The teaching of geometry implies, therefore, the recognition of students as people who are able to think rationally and find meaning of their own. The geometrician-builder measures words with the yardstick of meaning and not according to the social status of the speaker. The Enlightenment thinking of the period when Freemasonry moves from an operative to an intellectual-ethical movement was made possible only because human beings were thinking for themselves, measuring, analysing, reasoning and debating. In other words, the square and compasses that had once done duty simply as utilitarian instruments of a craft or trade now assumed a higher significance as symbols of a movement which changed everything in the history of human society and civilisation. 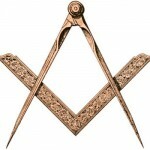 Descartes said: “I think, therefore I am.” In Freemasonry, it is summed up by the logo of the square and compasses.